Blended finance is at the heart of the discussion on how to attract private investors to help finance the Sustainable Development Goals (SDGs). Using concessional funding to catalyze private investments, blended finance amplifies the pool of funding and ideas available for development. In financial inclusion, the use of blended finance has a long track record and about a third of blended finance deals reported to the Convergence database target financial services. 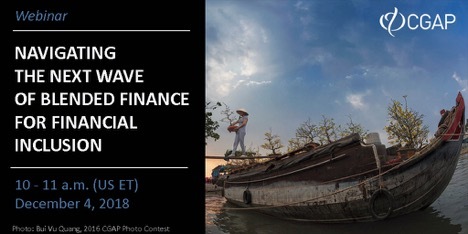 For this webinar, CGAP invited Joan Larrea, CEO of Convergence, and Milena Bertram, head of external relations at Finance in Motion, to present the state of blended finance today and share experiences from using blended finance in financial inclusion. CGAP will present opportunities for blended finance in financial inclusion and how to optimize the use of different funding sources. Participants are invited to share their experiences and feedback on CGAP's upcoming research on blended finance.